Who is your favorite out of the Spiders From Mars? Would you go out with Ziggy? 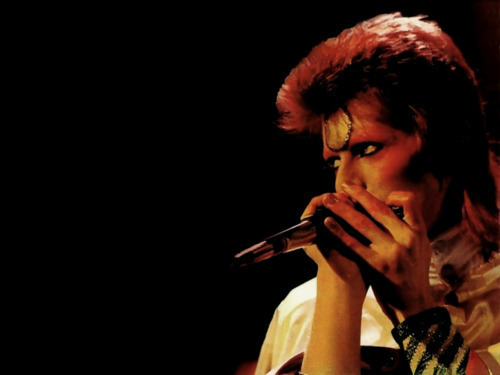 Do you miss Ziggy, now that he has been dead for 35 years? Which of these clothes do you like the most? What is your favorite performance from the Marquee Club? What is your favorite performance from the motion picture? From the first crashing chord of ''Watch That Man'' you know that this is a rock'n' roll album. If Ziggy Stardust was his Sgt. Pepper (a loose-fitting concept about an alter-ego rock band, but staggeringly good songs), then Aladdin Sane is Bowie's Exile on Main Street and, as if to prove a point, there's even a cover of a Stones song on here: the staunch rocker ''Let's Spend the Night Together''. The first official David Bowie Fan Club Magazine. I am currently conducting some research for an artist and we ae looking for images of the UK 1972-73 Ziggy Stardust tour. Please get in contact if you hvae any, I would really like to speak with you. You contact me here or at steven_burridge (at) hotmail (dot) come. a poll was added: Who is your favorite out of the Spiders From Mars? Wich of these songs is a cover?